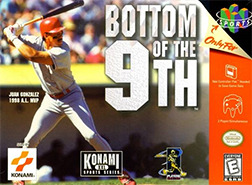 Bottom of the 9th for Nintendo 64 allows you to pick and hose team rosters from over 300 real MLB players. Different game play modes include Full Season, Exhibition game, Playoff modes. Some new features also include scenarios from past baseball seasons and a training mode to help the beginners learn the ropes.